Tribune file photo Steven Rosenberg, founder, owner and "chief eating officer" of Liberty Height Fresh Market, received the Community Service Award from Salt Lake Magazine. 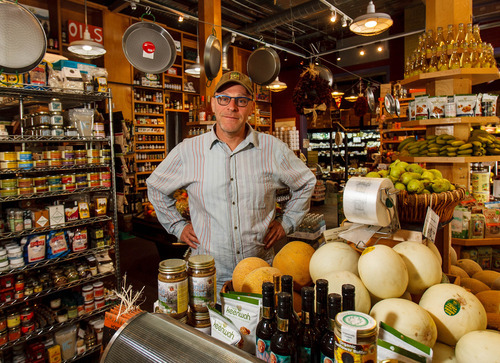 Steven Rosenberg, founder, owner and "chief eating officer" of Liberty Height Fresh Market has been raising the food consciousness of Salt Lake City for more than 20 years. For that reason  and because he has a stellar cheese selection and terrific sandwiches  he received the Community Service Award from Salt Lake Magazine. It was one of 18 awards announced Tuesday as part of the magazine&apos;s annual "Dining Awards" ceremony. "Steve Rosenberg does our city a great service just by being in business," magazine editors wrote in this blog post. He opened Liberty Heights "before there was such a thing as a certified cheese expert, before local food became a buzzword. In other words, Rosenberg gambled on Salt Lakers&apos; sense of taste." For a full list of winners visit saltlakemagazine.com.